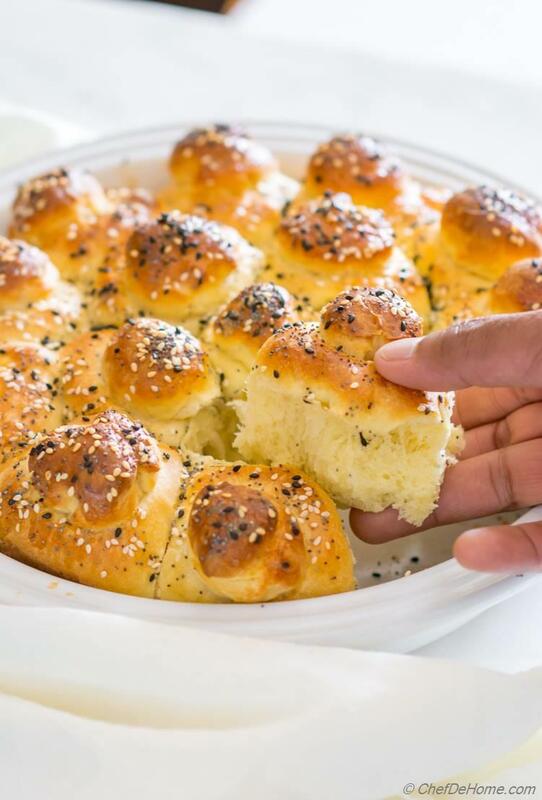 Festive pull-apart buttery brioche dinner rolls. Perfect for holiday dinner. Brioche Dinner Rolls, my festive take on dinner rolls with buttery petite brioche. 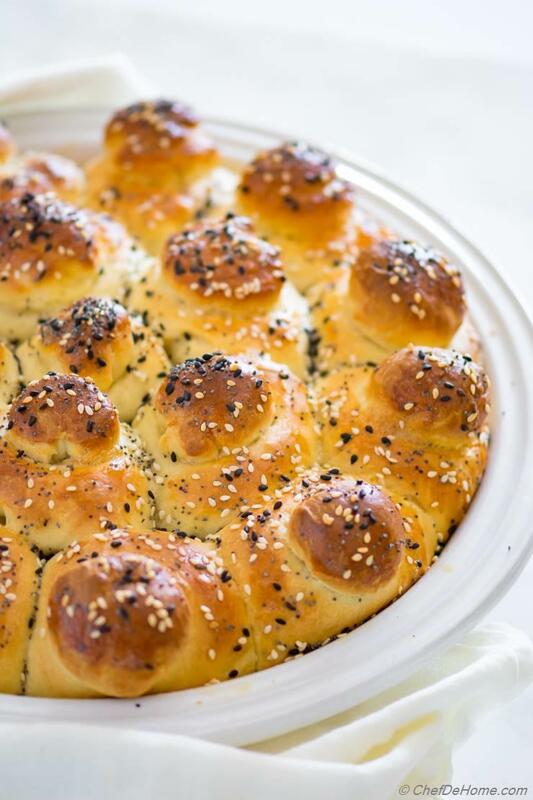 I snuggled these gorgeous mini brioche in a pan to serve family-style pull-apart dinner rolls. Do these look festive or what? The best part is, these are rich, buttery, soft, and pillow-like dinner rolls which only need 7 pantry ingredients. The toppings of poppy and sesame seeds was my touch but you can top'em with any available options. Pepeita seeds, roasted garlic, or even pecans would be great. This is my go-to recipe to make brioche bread at home. 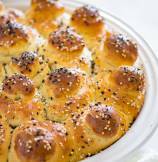 Idea to make brioche dinner rolls came to me in a bakery where petite brioche rolls were sold by dozen. 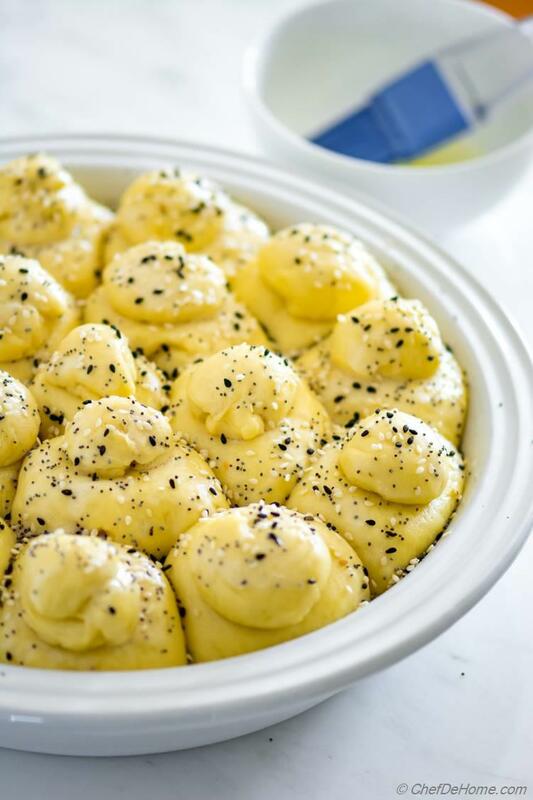 I loved those cute little miniature brioches and decided to fit these cozy together in one pan for that pull-apart family dinner experience. I must say, I don't regret a thing. Not only these look good but baking tuck together kept rolls more moist. Let's not wait. 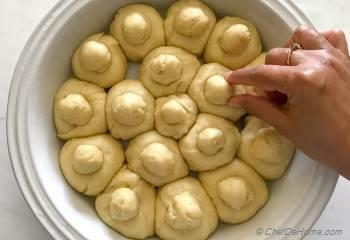 Learn to make these gorgeous holiday dinner rolls! Like I said, this Brioche dough recipe is variation of my brioche bread recipe. I started making brioche at home after being fed-up of price of brioche rolls in stores. Have you had this experience? Seriously, a 6-10 pack brioche rolls sell for $6+. So, why not spend sometime at home and perfect a recipe. Plus it will have tag of "homemade". Yes, please!!! This reminds me to ask you.. Do you know there are three kinds of brioche? Poor man's brioche - Few hours process, least amount of eggs and butter. Good for everyday use. 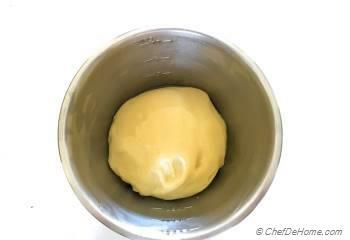 Everyone's brioche - Overnight process, use moderate amount of butter and eggs. It is moist, soft, and delicious buttery. Rich man's brioche - 2 days process, lot more eggs and butter. Very buttery, and flaky. I'm not sure which recipe stores follow.. but it definitely has price tag of Rich Man's Brioche ;-) lol! When baking for everyday dinner, I stick to poor man's recipe. 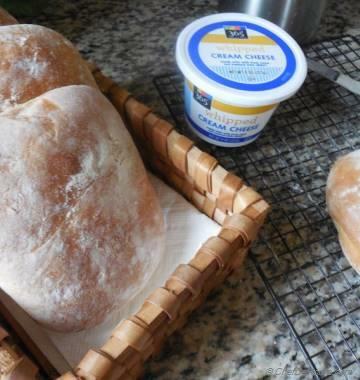 For special occasions like today's dinner rolls, I use a mix of first two which make buttery brioche rolls but are quick and simple. To bake brioche dinner rolls, I follow one tiny extra step than regular breads. I create a 20 minutes foam instead of just blooming the yeast. 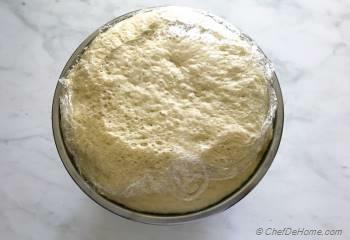 This foam gives airy texture to the bread as if I have used Bigah (Italian fermented mother dough). 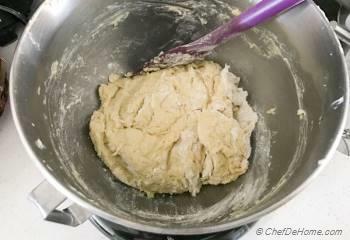 After dough is ready, I leave it to rise at room temperature for 2 to 3 hours until dough doubles and little more in size. These days, it is cold outside, it is good to place dough in switched-off oven. Once dough has risen, the process of making mini brioche rolls is exciting. You divide each piece of dough into two halves - one small, one big. Roll big one and place in the buttered dish. Make a thumb print and put the small one on top like a hat. This is a good kitchen activity for kids. Try sometime. (Like Ree says thank you for listening to a home chef). A second short rise of 1 hour until pan is filled and dinner rolls are ready for tour of oven. (ready to bake). Brushing with egg wash before baking brings gorgeous festive dinner roll color on brioche. Please don't skip that. I topped it with dust of poppy and sesame seeds. Use any seeds or nuts you prefer. Follow recipe up-to step -5. First rise, rolling of dough. Freeze'em before second rise and thaw at room temperature before baking. Baking instructions and rest everything stays the same. Wish you a wonderful day. I see you soon with another delicious recipe. This is Weekly Meal Plan week. Look for menu on Friday. 1. To make sponge, well mix sponge ingredients flour, yeast and half cup milk in a bowl. Set aside for 30 minutes. 2. In bowl of stand mixer or wide mixing bowl, combine sponge with flour, olive oil, sugar, salt, remaining milk, and 3 whole eggs and one yolk. (refrigerate remaining one egg white for egg wash). With spatula or paddle attachment mix everything. On slow speed, add room temperature butter 1/4 cup at a time until incorporated. Shift to hook attachment or transfer dough to flour dusted board. Knead for 6 minutes with dough hook or 10 minutes manually. 3. Transfer dough to oiled clean wide bowl. Cover with plastic wrap and dry kitchen towel. Place in a dry dark place until dough doubles in size. At-least 2 hours. 4. Punch down the dough and let rest for 5 minutes. In meantime, oil spray a 9" pie dish or sheet pan. 5. Divide dough into 15-16 equal portions. 6. From each portion, make one 1 inch ball, and one bigger with remaining. Place bigger ball in pie dish. Make a thumb impression in the center and place small ball on top. 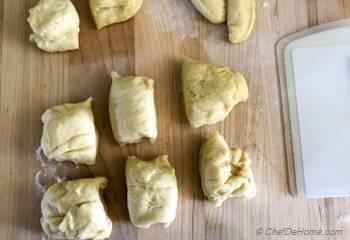 Repeat this step for all remaining dough until dish is filled with mini brioche dough rolls. Cover with dry kitchen towel and let rise for 1 hour. 7. When ready to bake, preheat oven at 375 degrees Fahrenheit. Gently spread egg wash on top and sprinkle seeds. Bake rolls for 20-22 minutes or until tops are golden brown and bigger brioche rolls register 190 degrees internal temperature. Let cool for 5 minutes, then immediately scrap the sides with knife and transfer to a wire rack. Cool for 10-20 minutes before serving. Brush salted melted butter before serving for more flavor. Thank you! The best rolls I have ever made, they were a huge success at thanksgiving dinner. I'm glad I no longer have to look for a dinner roll recipe, because I have found the best! Norma, I'm glad to hear your guests enjoyed these dinner rolls. Thanks for 5 stars and also we appreciate your sweet feedback. Please help us spread the word. Share it on your social media. Thanks. It says 7 ounces for the Active Dry Yeast? Usually I use one packet that is one quarter of an ounce, am I missing something where this one really uses that much yeast? Thanks! Hi Chrystal, thanks for pointing out. It was typo, should say 7 grams. I fixed it. Hi Ben, I'm glad you like these buns. I agree, can't go wrong with richness of brioche. Oh my gosh, Becky, look at these BUNS. Sorry, had to... but really, these look INCREDIBLE! Cannot wait to try! How sweet, Karly! Thanks my friend. I hope you get chance to try'em soon. I seriously want to jump into my screen and eat these. They look so good and I know my family would love them! Thanks, Karen! 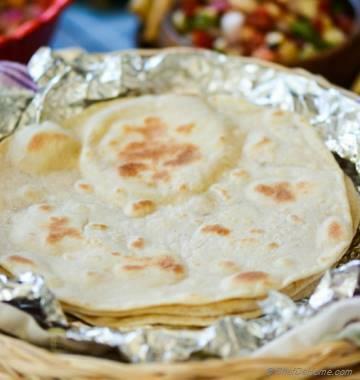 There is nothing more important than when family says "yes" to our food. Isn't it? I wish this screen was a window and I can pass you some rolls. :) Thanks once again for your sweet thoughts. OMG...these look amazing. I am such a bread lover...and would devour this!!! Perfect for the weekend brunch...and I bet the house smells amazing while they bake too. Ah, so sweet comment Gloria! Thanks. Indeed these dinner rolls made my kitchen smell like Thanksgiving feast day! Homemade is always the best. These brioche rolls look so beautiful!! I've also seen something similar sold in shops but have never thought to make it at home. Thank you for the inspiration! Thank you, Thanh! I'm glad you like these cute little brioche rolls. Honestly store bought rolls were my inspiration behind this recipe. 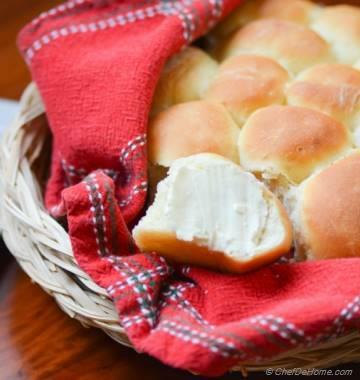 I can't resist homemade dinner rolls! 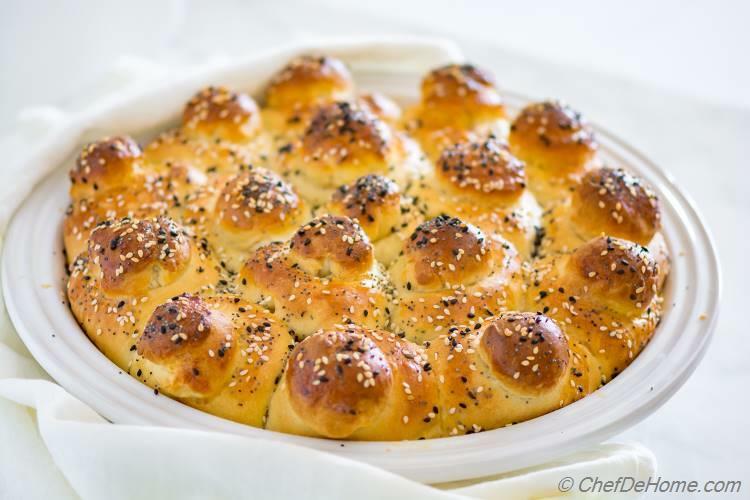 These brioche rolls look like the perfect addition to upcoming holiday meals! Jessica, our love for homemade dinner rolls is certainly mutual. Thanks for sharing your thoughts with us. Hi there, I will certainly post rich brioche's recipe whenever I get time. Thanks for asking. Please subscribe to CDH newsletter for updates.